I know that there are lots of smartphone users out there that would like to have their cake and eat it too. These folks are looking for a smartphone with a touchscreen and a nice QWERTY physical keyboard for typing. 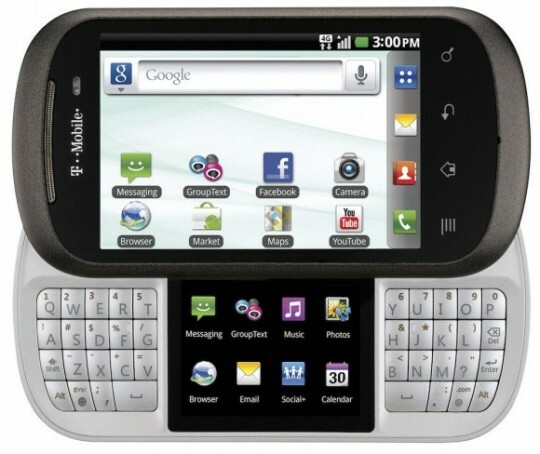 T-Mobile has landed a new LG smartphone called the DoublePlay that is an Android Gingerbread 2.3 smartphone with some nice features for those wanting real buttons. The smartphone has a 5MP rear camera and should hit T-Mobile USA stores in time for holiday gift giving. Details on this smartphone leaked last week, but the official word from T-Mo brings almost all the details that you want to know. The front main screen is a 3.5-inch unit and the smaller screen between the keyboards is a 2-inch unit. That 5MP rear camera has 720p HD video recording capability. The processor is a 1GHz Qualcomm Snapdragon and the software for the phone has been customized to allow the secondary screen to show different elements of the same app or to allow you to run two apps at once. Now you can play Angry Birds while feeding Om Nom with some rope cutting. The smartphone also has WiFi, Bluetooth, and HSPA+ 4G connectivity. Pricing is still unknown as is the official launch, but we should hear more around the National Texting Championship kicking off October 26.